Pandarus is a GIS software toolkit for regionalized life cycle assessment (LCA). It is designed to work with brightway LCA framework, brightway2-regional, and Constructive Geometries. A separate library, pandarus-remote, provides a web API to run Pandarus on a server. Overlay two vector datasets, calculating the areas of each combination of features using the Mollweide projection. Calculate the area of the geometric difference (the areas present in one input file but not in the other) of one vector dataset with another vector dataset. Calculate statistics such as min, mean, and max when overlaying a raster dataset with a vector dataset. The outputs from Pandarus can be used in LCA software which does not include a GIS framework, thus speeding the integration of regionalization into the broader LCA community. There is also a conference presentation video introducing Pandarus and its integration into LCA software. Pandarus is open source under the BSD 3-clause license. In addition to this documentation, there is also a Jupyter notebook usage example. The main capability of the Pandarus library is to efficiently and correctly intersect the set of spatial features from one vector dataset with the spatial features from another vector dataset. In regionalized life cycle assessment, the first dataset would be inventory locations (polygons, lines, or points), and the second dataset would be regions with site-dependent characterization factors. Calculate the intersection of two vector spatial datasets. The first spatial input file must have only one type of geometry, i.e. points, lines, or polygons, and excluding geometry collections. Any of the following are allowed: Point, MultiPoint, LineString, LinearRing, MultiLineString, Polygon, MultiPolygon. The second spatial input file must have either Polygons or MultiPolygons. Although no checks are made, this and other functions make a strong assumption that the spatial units in the second spatial unit do not overlap. first_fp: String. File path to the first spatial dataset. first_field: String. Name of field that uniquely identifies features in the first spatial dataset. second_fp: String. File path to the second spatial dataset. second_field: String. Name of field that uniquely identifies features in the second spatial dataset. first_kwargs: Dictionary, optional. Additional arguments, such as layer name, passed to fiona when opening the first spatial dataset. second_kwargs: Dictionary, optional. Additional arguments, such as layer name, passed to fiona when opening the second spatial dataset. dirpath: String, optional. Directory to save output files. cpus: Integer, default is multiprocessing.cpu_count(). Number of CPU cores to use when calculating. Use cpus=0 to avoid starting a multiprocessing pool. driver: String, default is GeoJSON. Fiona driver name to use when writing geospatial output file. Common values are GeoJSON or GPKG. compress: Boolean, default is True. Compress JSON output file. Returns filepaths for two created files. id: Integer. Auto-increment field starting from zero. from_label: String. The value for the uniquely identifying field from the first input file. to_label: String. 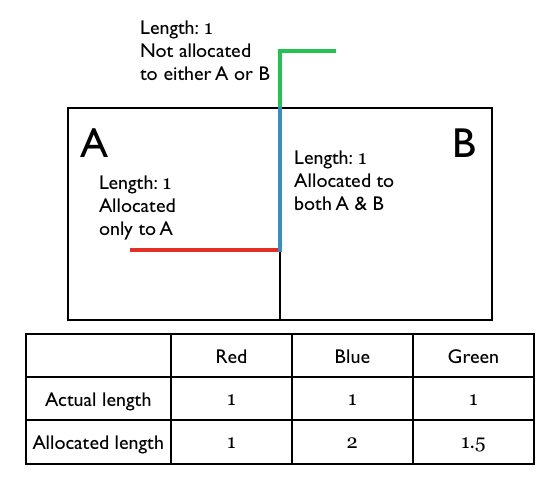 The value for the uniquely identifying field from the second input file. measure: Float. A measure of the intersected shape. For polygons, this is the area of the feature in square meters. For lines, this is the length in meters. For points, this is the number of points. Area and length calculations are made using the Mollweide projection. 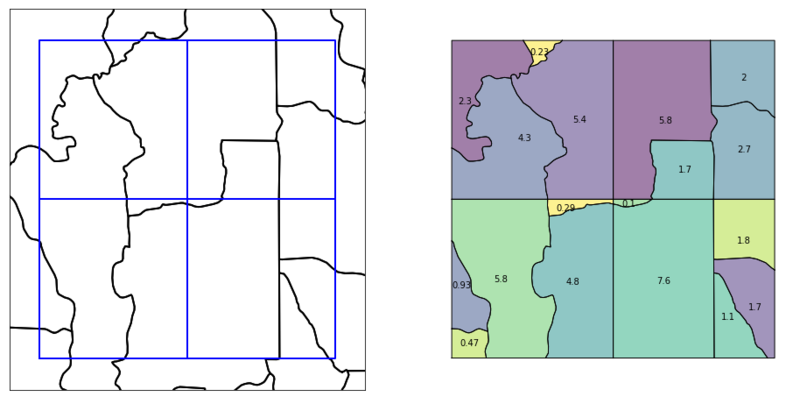 Because Pandarus was designed for global data sets, the Mollweide projection is used as the default equal-area projection for calculating areas (in square meters). Although no projection is perfect, the Mollweide has been found to be a reasonable compromise . The function intersect calls intersection_dispatcher, which in turns calls intersection_worker, which itself calls get_intersection. In both intersect and intersection_dispatcher, spatial units from both the first and second datasets are unprojected. Inside the function intersection_worker, spatial units from the first dataset are projected to WGS 84. get_intersection calls Map.iter_latlong on the second dataset, which returns spatial units projected in WGS 84. Area and linear calculations are done on the intersection of spatial units from both the first and second spatial datasets, and are projected to the Mollweide CRS. This projection is done at the time of areal or length calculations. When calculating the lengths of lines (or number of points) remaining outside a intersected areas, we have the problem that lines can lie along the edge of two vector features, and hence the section of the line would be counted twice. If therefore need to adjust our formula for calculating the lengths (or number of points) outside an intersected area. The key insight is that we don’t want the actual remaining area, but the right relative remaining area - these value are all normalized to one anyway. The same procedure is followed for multipoints (geometries that have more than one point), except that instead of calculating lengths you just count the number of points. For many regionalized methodologies, it is important to know how much area/length from one spatial dataset lies outside a second spatial dataset entirely. The function calculate_remaining calculates these remaining areas. Calculate the remaining area/length/number of points left out of an intersections file generated by intersect. source_fp: String. Filepath of the input spatial data which could have features outside of the intersection result. source_field: String. Name of field that uniquely identifies features in the input spatial dataset. intersection_fp: Filepath of the intersection spatial dataset generated by the intersect function. source_kwargs: Dictionary, optional. Additional arguments, such as layer name, passed to fiona when opening the input spatial dataset. dirpath: String, optional. Directory where the output file will be saved. compress: Boolean. Whether or not to compress the output file. source_fp must be the first file provided to the intersect function, not the second! Process an intersections spatial dataset to create two intersections data files. fp is the file path of a vector dataset created by the intersect function. The intersection of two spatial scales (A, B) is a third spatial scale (C); this function creates intersection data files for (A, C) and (B, C). As the intersections data file includes metadata on the input files, this function must have access to the intersections data file created at the same time as intersections spatial dataset. If the metadata filepath is not provided, the metadata file is looked for in the same directory as fp. Returns the file paths of the two new intersections data files. Pandarus can calculate mask a raster with each feature from a vector dataset, and calculate the min, max, and average values from the intersected raster cells. This functionality is provided by a patched version of rasterstats. The vector and raster file should have the same coordinate reference system. No automatic projection is done by this function. Create statistics by matching raster against each spatial unit in self.from_map. For each spatial unit in self.from_map, calculates the following statistics for values from raster: min, mean, max, and count. Count is the number of raster cells intersecting the vector spatial unit. No data values in the raster are not including in the generated statistics. This function uses a fork of the rasterstats library that break each raster cell into 100 smaller cells, as a compromise approach to handle the fact that some raster cells are completely with a vector geometry, while others only have a small fraction of their cell area within the vector geometry. Each of the 100 small raster cells is weighted equally, and each is tested to make sure it intersects the vector geometry. This function assumes that each smaller raster cell has the same area. This may change in the future. vector_fp: str. Filepath of the vector dataset. identifying_field: str. Name of the field in vector_fp that uniquely identifies each feature. raster: str. Filepath of the raster dataset. output: str, optional. Filepath of the output file. Will be deleted if it exists already. band: int, optional. Raster band used for calculations. Default is 1.
compress: bool, optional. Compress JSON results file. Default is True. fiona_kwargs: dict, optional. Additional arguments to pass to fiona when opening vector_fp. Any additional kwargs are passed to gen_zonal_stats. Pandarus provides some utility functions to help manage and manipulate raster files. Raster files are often provided with incorrect or missing metadata, and the main pandarus capabilities only work on vector files. Unfortunately, however, many raster files require manual fixes outside of these functions. fp: String. Filepath of the input raster file. new_fp: String, optional. Filepath of the raster to create. If not provided, the new raster will have the same name as the existing file, but will be created in a temporary directory. band: Integer, default is 1. Raster band to clean and create in new file. Each band of a multiband raster would have to be cleaned separately. nodata: Float, optional. Additional value to try when changing nodata value; must not be present in existing raster data. Returns the filepath of the new file as a compressed GeoTIFF. Can also return None if no new raster was written due to failing preconditions. 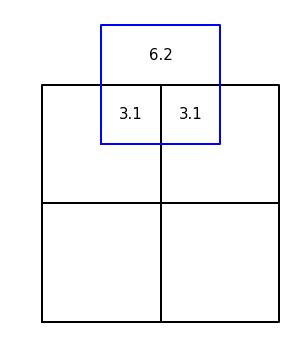 Round raster cell values to a certain number of significant digits in new raster file. For example, π rounded to 4 significant digits is 3.142.
in_fp: String. Filepath of raster input file. out_fp: String, optional. Filepath of new raster to be created. Should not currently exist. If not provided, the new raster will have the same name as the existing file, but will be created in a temporary directory. band: Int, default is 1. Band to round. Band indices start at 1.
sig_digits: Int, default is 3. Number of significant digits to round to. The created raster file will have the same dtype, shape, and CRS as the input file. It will be a compressed GeoTIFF. Returns out_fp, the filepath of the created file. Convert raster file at filepath to a vector file. Returns filepath of created vector file. dirpath should be a writable directory. If dirpath is no specified, uses the appdirs library to find an appropriate directory. band should be the integer index of the band; default is 1. Note that band indices start from 1, not 0. The generated vector file will be in GeoJSON, and have the WGS84 CRS. Because we are using GDAL polygonize, we can’t use 64 bit floats. This function will automatically convert rasters from 64 to 32 bit floats if necessary. The software overlays (matches) two different maps, and Pandarus was a bit of a matchmaker himself. Plus, ancient names are 172% more science-y. Pandarus can be installed directly from PyPi using pip or easy_install , e.g. You should replace <virtualenv name> with a name you will remember. Pandarus is only compatible with Python >= 3.5. Source code is on GitHub. Contributions are welcome via pull requests and issues on Github. Please ensure that pull requests include tests and documentation. Pandarus follows the Contributor Covenant code of conduct. © Copyright 2013, Chris Mutel, ETH Zürich, and PSI. Revision b0badc4b.